Police yesterday arrested the eldest daughter of Lt Col (retd) Khandaker Abdur Rashid, a fugitive condemned to death in Bangabandhu murder case, for suspected links to Wednesday's bomb attack on Awami League lawmaker Fazle Noor Taposh. The Detective Branch picked up Khandaker Mehnaz Rashid from her father's residence at Gulshan-2 in the morning. Later in the day, a court placed her on a five-day remand. 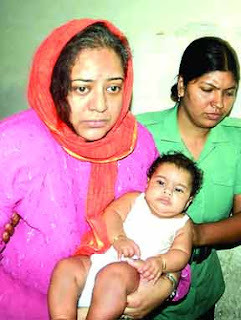 Mehnaz is the second to be arrested from among the families of convicted killers of Bangabandhu Sheikh Mujibur Rahman. Earlier on Thursday, police held Kamrul Haque Swapan, younger brother of Major (retd) Shariful Haq Dalim. Both Dalim and Rashid have been holed up abroad since the trial of August 15 killings began in 1996. Earlier in that year, AL came to power and Sheikh Hasina became the prime minister. DB sources said Mehnaz has been involved in reorganising Freedom Party, an outfit formed by the self-confessed killers of Bangabandhu and most of his family members. She contested the parliamentary polls in 2001 and 2008 from Chandina of Comilla on Freedom Party ticket. Metropolitan Magistrate Tania Kamal remanded Mehnaz for five days in response to police prayer for 10 days'. DB Assistant Commissioner Ali Akbar said a team led by AC Moniruzzaman made the arrest at house-7 on road-55 in Gulshan-2 at around 6:30am. On the arrestee's request, police allowed her elderly domestic help to be with her for looking after her three-month-old daughter. Mehnaz said her husband Rafiqul Islam was not home overnight as he did not return from his brother's house in Badda. She also told police her parents are settled in Libya along with her three other sisters, while she and her husband live in her mother's Gulshan house. With her arrest, police have so far detained three leaders of Freedom Party in connection with the attempt on the life of Taposh, whose parents were among those killed along with Bangabandhu and family on August 15, 1975. The investigators however declined to say what exactly the charges against the three are. AC Ali Akbar, also investigation officer of the bomb attack case, said the other detainee, Abdur Rahim, was hauled in from the city's Fakirapool area on Thursday. A hotelier by profession, he was press secretary of Freedom Party. Akbar said they had gathered that Dalim's brother Swapan, who was arrested at his Gulshan residence, used to live in Pakistan and returned to Dhaka recently. "We arrested him and Rahim as complainant of the case [MP Taposh] suspects their links to the attack." Besides, Akbar claimed, they too have information that for the last few days Swapan had been organising cadres to carry out the attack. Taposh, also nephew of Prime Minister Sheikh Hasina, is part of the team aiding the prosecutors in five convicts' appeals against the HC verdict in Bangabandhu murder case. A lawmaker from Dhaka-12, he has alleged that the attack on him was designed to interrupt the court proceedings. In the case filed with the Motijheel Police Station, he named none, but said families and friends of the convicted killers of Bangabandhu and family plotted the attack. AC Akram said seven teams of DB have been assigned to crack the blast case. DB sources said one team is working to track down the calls made through cellphone towers near the blast scene and surrounding areas. Another team headed by AC Mohammad Nasir Uddin is interrogating the arrestees at the DB headquarters. Meanwhile, Taposh yesterday again alleged the killers of Bangabandhu hurled bombs at him on Wednesday. He said the attack was made at a time when the Supreme Court is hearing appeals by convicts in Bangabandhu murder case. He was talking to reporters while State Minister for Home Shamsul Haque Tuku was visiting him at his residence. Tuku echoed the lawmaker's words. Besides, he said tough actions would be taken against the perpetrators. He said the attack was not a stray incident. Rather, it was a continuation of the conspiracy to annihilate Bangabandhu's family, Awami League and pro-Liberation War forces.